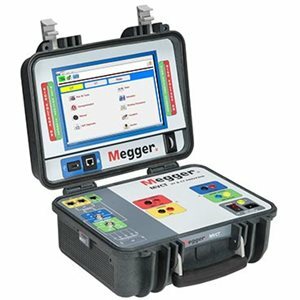 The Megger MVCT test set is a lightweight, robust, portable unit capable of testing both current and voltage transformers. At less than 20 lb (10Kg) the MVCT is a highly portable unit that also offers accuracy in testing. Capable of performing saturation, ratio, polarity, winding resistance, and insulation tests on current transformers, the MVCT can also be used for testing metering and protection class voltage/potential transformers. The MVCT provides a microprocessor controlled variable voltage and current output along with precision instrumentation for automatically testing single and multi-ratio CTs and VT’s. The MVCT makes testing CTs easy. It will directly connect to multi ratio CT’s and perform all tests – saturation, ratio and polarity, winding resistance, and insulation – on all taps with the push of a button and without changing leads. This greatly reduces testing time. The MVCT can be controlled via its large, full color, high resolution, sunlight readable TFT LCD touch screen display. This interface allows the user to perform manual and automatic testing quickly and easily using the manual test screen, or by using pre-constructed test routines. The large color display also permits the user to easily read all pertinent data while the test is being performed and provides the ability to view the results when the test is complete. The unit can also be configured to come without a display and thus be controlled via a laptop utilizing PowerDB or with Megger’s existing Smart Touch View Interface™(STVI). Note: The downloaded file will be named "Install_powerdb_XXX.zip"
Note: The downloaded file will be named "Onboard_powerdb_XXX.zip"